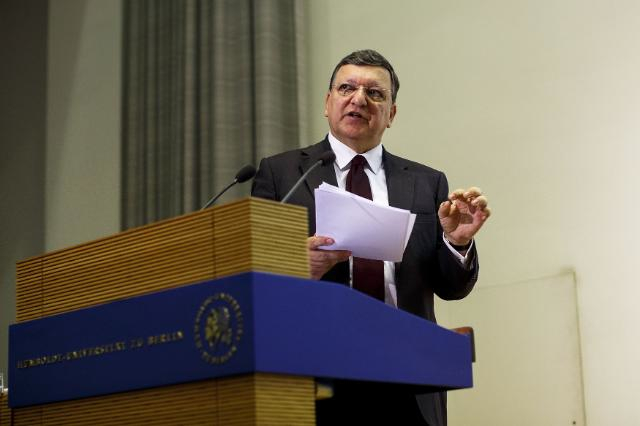 The lack of support to European Union institutions may become a threat to European integration itself, Commission President José Manuel Barroso warned in a major speech delivered at Berlin’s Humboldt University on the occasion of Europe Day. Barroso, whose second term as Commission President expires in November, named three gaps in the functioning of the EU. His warning comes two weeks ahead of the European Parliament elections, that will be held across the Union on 22-25 May. First, he saw a governance gap, because in his words member states on their own no longer have what it takes to deliver what citizens need, while European institutions still lack part of the equipment to do so. He then mentioned a legitimacy gap, because he said citizens perceived that decisions are taken at a level too distant from them. Third, he said there was an expectations gap, because people expected more than the political system can deliver. Barroso added that there was no automatic way for the 28 member countries to agree the tools to repair these gaps at European level. He argued for national governments and mainstream parties to show greater political will for EU cooperation. “No treaty change, no institutional engineering can replace the political will for Europe”, he said. Any political project needs a minimum of sustained support, Barroso insisted. Just two weeks from the European elections, the Commission President spoke in critical terms of the centre-left and the centre-right political forces in EU countries, whom he said should “leave their comfort zone” and confront the growing voices of euroscepticism and even europhobia. Instead of abandoning the debate to the extremes, mainstream political forces have to recover the initiative and “make the case for a positive agenda for Europe”, both at the national and the Union level, Barroso said. He regretted that in many cases, the mainstream forces had “internalised populist arguments rather than countering them”. He provided no details, but the episode in which he attacked the British Conservatives who he said were “looking like UKIP”, the Eurosceptic party of Nigel Farage which according to polls is likely to win the EU elections is still vivid [read more]. Barroso described “the essence of the European project” comparing it with the digits normally used to describe the evolution of internet. He called the first phase of the European project ‘Europe 1.0’ – devised after the Second World War, the European project was about safeguarding peace and prosperity in the free part of Europe through economic integration and based on Franco-German reconciliation. Redesigned after the fall of the iron curtain and the Berlin Wall – ‘Europe 2.0’, he said, was focused on extending the benefits of open markets and the open society to an enlarged, reunited Europe. With the fallout from financial and economic crisis and the emergence of the multipolar world of globalisation, the third phase of European integration set in. “We now need to update to what we could call ‘Europe 3.0’”, Barroso said. But the Commission President said he didn’t expect a European ‘Philadelphia moment’, the creation of a constitution from scratch, referring to the 1787 constitutional convention in the USA. The Union’s way of developing will continue to be ‘permanent reform’ rather than ‘permanent revolution’, said Barroso, using terms reminiscent of his Maoist youth. The Commission President apparently made a gesture toward the UK conservatives who want to get rid, if not of EU membership, of a lot of the bureaucratic legislation to which their country is bound. “A clean-up of the existing over-complexities and contradictions within the treaties and between the treaties and other instruments should precede further additions”, Barroso said. Barroso aslo made a gesture toward the non-eurozone members who fear that the future EU may relegate them to second-rank members. “Any new intergovernmental solutions should be considered on an exceptional and transitional basis only in order to avoid accountability and coherence problems”, Barroso said. But he added that the mechanisms for closer integration for the countries willing to integrate closer should be maintained. “The pace of development must not be dictated by the most reticent. The speed of Europe must not be the one of the slowest”, he said. Further innovations of the functioning of EU institutions could be considered, he went on. In the medium term, he said that the office of the Vice-President of the Commission responsible for economic and monetary affairs and the euro could be merged with the office of the President of the Eurogroup. He also said that a more radical innovation, such as merging the office of the President of the European Commission with the office of the President of the European Council, would be a question for the longer term. Long hailed as a major breakthrough brought by the Lisbon Treaty, the position of Council President appears redundant, especially following EU summits when both its holder Herman Van Rompuy and Barroso appear to debrief the media. Also, the position of Council President has failed to become that of “Mr. Europe”, since the major political forces see the job of Commission President as the prize for winning the elections. Good, Maybe more people realise that all the eussr wants is ever increasing territory, lebensraum and ever closer union, and are getting sick of the empire building process beloved of failed unelected politicians, like barosso. Gosh are these people finally realizing there is little public support for all their empire building.